Access to water, sanitation and hygiene (WASH) are crucial for good outcomes in health, nutrition, education, economic development and poverty reduction. The problems associated with inadequate WASH services affect virtually all aspects of human development, disproportionately affecting women and girls. I grew up in the remote village of Umueziukwu in Onicha Local Government Area of Ebonyi state, Nigeria. In 1995, as a primary one pupil, I witnessed instances where classmates stayed away from school for days. Upon recommencement and during roll calls, many of them would be lined up for “beating” for absenteeism without permissions – usually in written forms from parents/guardians. On occasions, my friends would cry and appeal that they be pardoned, citing illness and incapacitation. It was a common phenomenon. 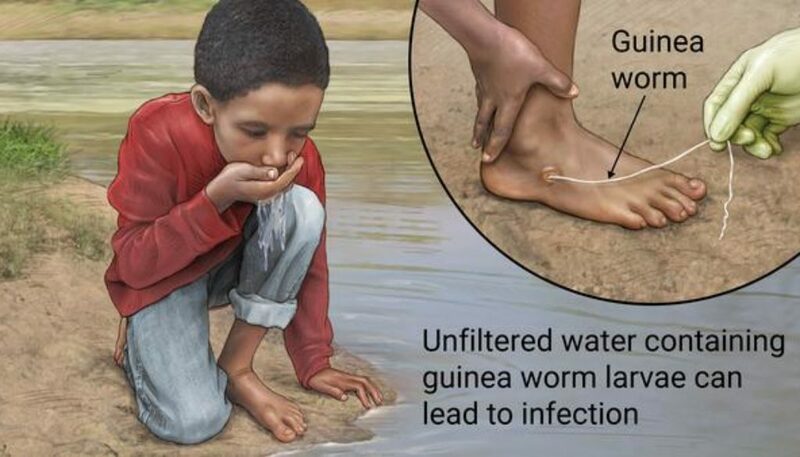 As vividly as I can remember, the commonest reason my classmates maintained low attendance in school was Dracunculiasis, also called Guinea-worm disease (GWD). A simple search on Wikipedia reveals that a person becomes infected when they drink water that contains water fleas infected with guinea worm larvae. After some time, the female worms form a painful blister in the skin, usually on a lower limb. Other symptoms may include vomiting and dizziness. During this time, it may be difficult to walk or work. Because of this usual incapacitation, victims stayed away from school for days, weeks and even months. Until I became 12 and left home for a boarding house, I “travel” about 10km everyday (with my elder sisters) to fetch water for domestic uses from Egu-Ugba. Egu-Ugba is a stagnant pond – a community-owned asset for Umueziukwu but it serves other adjoining communities. The name is derived from a deity that prevents the pond from drying up during dry seasons, until it is regenerated by another cycle of rainfall. The daily travel was conducted in phases – early in the mornings before we prepare for school and in the evenings before my mother comes back from the market. If you missed any of the sessions, you risked your breakfast or dinner as the case may be. My mother made the rules and enforced it devotedly. To obtain water from the “cleaner” part of the pond, my sisters would walk into the pond up to thigh level, the part never stirred by fetchers before us. When we come back, my mother would add alum (aluminum sulphate) to cause coagulation and flocculation as a treatment measure whenever she had the time. But residents drank straight from Egu-Ugba without boiling it. That I was never diagnosed of GWD remains a mystery to me. However, I remain terrified that the entire household “played” with water fleas, unknowingly. Till this very day, nothing has changed quite remarkably except for boreholes (“pump” as it is called) scattered along strategic clusters in the community. In Nigeria, it is estimated that 60 million Nigerians live without clean water, 120 million lack access to decent toilet facilities and 46 million practice open defecation. More disturbing is the fact that annually, about 60,000 Nigerian children, under the age of five, die of WASH-related diseases. This could imply that with 12 years left to the attainment of the SDGs (Vision 2030), Nigeria will find it extremely difficult to achieve #SDGs Goal 6: Ensure access to water and sanitation for all. WASH is fundamental to health and well-being, forming an effective barrier against disease transmission. Despite global progress on child mortality, courtesy of Millennium Development Goals (MDGs), infectious diseases still pose the greatest threat to vulnerable children, especially children under five. According to the WHO/UNICEF Joint Monitoring Programme (JMP), 50% of schools in Nigeria do not have any water facility and 52% lack access to toilet facilities. In fact, if you walk around school facilities in any state in Nigeria, you would have reasons to argue that the issue is underreported. However, the crisis remains unacceptable and should be challenged. My experience in 1995 had not left me. So early in January 2019 when an opportunity emerged that I lead a national campaign on WASH, I never hesitated. A major outcome from the project was that CODE mobilized a total of 36 House of Assembly; National Assembly and Gubernatorial Candidates in Edo, Lagos and Kano States to sign Pledge Cards, declaring to prioritize WASH delivery when elected into office. In the next four years and beyond, I would commit targeted efforts to engagement with authorities and office holders, tasking them on fulfillment of their commitments and campaign promises and of course improvement of lives especially in marginalized rural communities. Taking WASH to the Grassroots is a national campaign (activities can be tracked on Twitter using #Vote4WASH) where Connected Development (CODE) in partnership with WaterAid Nigeria; demonstrated resilience and achieved a new record in the history of citizen engagement in Nigeria. We mobilized community leaders and non-profit stakeholders to promote WASH to the mainstream of political debates and conversations during 2019 electioneering and general elections. During engagements publicly declaring to revitalize rural/urban water schemes upon electoral victories was a high point and we documented outcomes, carefully. In turn, electorates were urged to perform their civic responsibility (voting) being WASH conscious and making considerations to candidates who had signed pledge cards to improve access to WASH services. Although the support of the international donor community will remain critical in the developing world, it will remain incumbent upon national governments to dramatically increase investments. Accountability and improved financial performance can help attract additional external sources of financing and facilitate private sector involvement, argues United Nations World Water Development Report 2019. Today, as the world marks International world Water Day, governments in Nigeria, national and sub-national, must support comprehensive investment and revitalization of rural/urban water schemes to ensure that public facilities – schools, health centres, markets and parks; are properly equipped with water and sanitation services. These services must be inclusive and affordable with special attention to disadvantaged or under-served groups in the society. In summary, lack of access to potable water comes with a huge cost especially for the poor and vulnerable. Because they are excluded from central reticulated water and sanitation networks (where they exist), they rely on alternatives (usually more costly) such as water vendors. By implication, this is driving exclusion, entrenched power asymmetries, poverty and material inequalities in Nigeria. No child, in any part of the world should be allowed to contend with either Guinea worm or other water borne diseases. Governance, let alone democracy, is facing grievous, structural challenges in Nigeria but WASH services should remain a priority sub-sector. From time immemorial, this cliché: Water is life, remains a popular one. To end with a question,does lack of water mean death? Governments in Nigeria must answer this question. As we commit to local actions in pursuit of the SDGs, indeed, efforts must be coordinated that we “Leave No one Behind”.